Magnetic resonance imaging-conditional devices: Where have we reached today? Scientific growth in the field of magnetic resonance imaging (MRI) and cardiac devices has been exponential in recent decades. Cardiac implantable electronic devices due to their ferromagnetic constituents in leads and device body have always been an issue if patients need MRI. MRI is relatively safe. Recent introduction of changes in leads and device body constituents renders them less ferromagnetic, making MRI less frightening to a certain extent. Simultaneously, there is increasing research interest in MRI. Not only anatomy and pathology but also physiology of cardiac and nervous structures can be imaged. It is estimated that 53%–64% of intracardiac defibrillator (ICD) patients will require an MRI determination over a 10-year time horizon, highlighting the importance of MRI-conditional devices for this patient population. In this article, we briefly describe evolution and current status of conditioning of cardiac devices to make them MRI-friendly and briefly discuss where we are in terms of our physician role with respect to MRI-conditional devices. Advances in imaging anatomical structure and physiology with MRI and MR angiography over the last two decades have led to MR becoming an increasingly attractive imaging modality, especially in the brain and heart imaging. Brain anatomy, physiology, spatial resolution, and spatial specificity of neuronal activation as detected by MRI have markedly improved over the past decade. Multimodal MRI techniques including quantitative blood flow, blood volume, and oxygen extraction fraction measurements are becoming routine. These techniques have been applied to study cerebral physiology and neuroenergetics under various experimental conditions in normal brains and diseased states such as stroke. MRI provides excellent spatial resolution and multiplanar three-dimensional analysis, while not exposing patients to ionizing radiation, risks of invasive procedures, or potentially nephrotoxic-iodinated contrast agents. MRI has emerged as a broadly applied diagnostic tool for patients with neurovascular and cardiovascular diseases, and therefore, the number of patients undergoing scanning each year is increasing. In parallel, increasing number of patients is being treated with permanently or temporarily implanted cardiovascular devices. Atherosclerotic plaque composition is known to be associated with its propensity to rupture and cause vascular events. MRI of atherosclerotic plaque using 1.5 T scanners can detect plaque composition. Recently, a new pulse sequence called modified Look-Locker inversion recovery was developed for T1-mapping enabling the quantitative evaluation of myocardial T1 either without contrast, so-called native T1, or postcontrast. Native T1 is especially useful in patients who cannot receive gadolinium-based contrast agents because of Stage 4 or 5 chronic kidney disease. 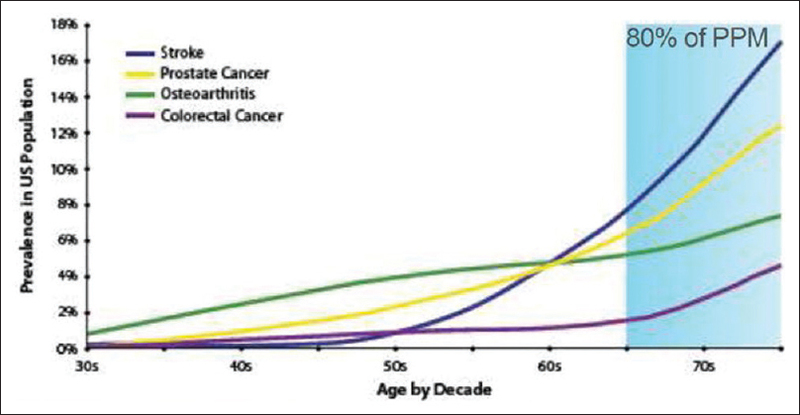 Native T1 is the highest in patients with amyloidosis, many of whom have chronic kidney disease. It is elevated to an intermediate degree in hypertrophic cardiomyopathy and other nonischemic cardiomyopathies. Postcontrast T1-mapping is used to calculate extracellular volume (ECV), which is elevated in the setting of interstitial fibrosis or other causes of increased extracellular space such as edema and/or inflammation. Elevated ECV has been documented in hypertensive heart disease, hypertrophic cardiomyopathy, and heart failure with preserved ejection fraction. Increased ECV has been associated with adverse short-term cardiac prognosis in a diverse patient population. The group at Oxford has studied native T1 at rest and with adenosine stress, showing that native T1 is sensitive to changes in myocardial blood volume, which may be a sensitive marker of ischemia. They found that normal myocardium increased native T1 with adenosine by >6%, whereas infarcted myocardium showed essentially no increase. Ischemic myocardium showed an intermediate increase of approximately 4%. A major advance here is the ability to perform stress cardiac MR studies without using gadolinium. How does magnetic resonance imaging affect cardiac devices? Risks associated with MRI generally arise from three distinct mechanisms related to MRI: (1) static main magnetic field, (2) radiofrequency (RF) energy, and (3) gradient magnetic fields [Figure 4]. There are several potential risks associated with MR scanning of specific cardiovascular devices that result from these processes [Table 1]. Most of these risks can be understood by consideration of the areas as discussed below [Table 2]. Most currently used clinical MR scanners are 1.5–3 T, which corresponds to ~30,000–60,000 times the strength of the earth's magnetic field. The greatest risk from the main magnetic field is attraction of a ferromagnetic object into the scanner. The term “ferromagnetic” is used to denote a substance that experiences an attractive force in the presence of a magnetic field. As a result of ferromagnetic interactions, a device may be moved, rotated, dislodged, or accelerated toward the magnet at dangerously high velocities and dangerously high forces, creating a “projectile effect” that could lead to significant patient injury or damage to the MR system. Device function may also be altered or negated as a result of interactions with the strong static magnetic fields. During MRI, RF energy is “pulsed” into the body to generate the MR image. The body will absorb some of the RF power and therefore will heat up (usually <1°C) directly owing to ohmic heating. The dosimeter term used to characterize RF energy is the specific absorption rate (SAR, measured in watts per kilogram). SAR increases with the square of the field strength. Certain metallic devices (such as leads) can act as an “antenna” and concentrate this RF energy, which leads to excessive local heating, especially at the tip of these devices. Fractured leads may pose a particularly high risk of thermal injury. Concentration of RF energy is frequency dependent and therefore changes for a given device in different field strength. RF energies used in the MRI process can also induce electrical currents in wires and leads, which could possibly induce arrhythmias. Time-varying magnetic fields called gradients (dB/dt, measured in Tesla per se cond) are used to encode for various aspects of the image acquisition. Although the gradients are much weaker than the main magnetic field, the gradients are repeatedly and rapidly turned on and off. The rapidly changing magnetic fields from the gradients can induce electrical currents in electrically conductive devices and may directly excite peripheral nerves. Although current-generation scanners operate at levels that will not directly excite cardiomyocytes, the gradients can induce currents within electrically conductive wires and leads that could cause arrhythmias. The very flow of electrically conductive blood in the presence of powerful static magnetic fields produces very small voltages that may produce electrocardiographic aberrations, including elevation of the ST-segment, T-wave abnormalities, and even the appearance of arrhythmias. The stronger the static magnetic field, the greater the magnitude of these observed perturbations. This phenomenon may involve monitoring of the heart rhythm during scanning, leading to inappropriate inhibition of pacemaker function, or creating arrhythmia artifacts on event loop recorders. In 1997, the Food and Drug Administration (FDA), Center for Devices and Radiological Health, proposed the definitions for the terms [Figure 5] as shown below. It refers to an item that poses no known hazards in any MR environment. “MR safe” items include nonconducting, nonmetallic, and nonmagnetic items, such as a plastic Petri dish More Details. There is no MRI safe cardiac pacing device or defibrillator. Conditional means that device has been conditioned or modified such that it poses no known hazards in a specified MRI environment with specified conditions of use. Conditions that define the MR environment include static magnetic field strength, spatial magnetic gradient, dB/dt (time-varying magnetic fields), RF fields, and SAR. Additional conditions, including specific configurations of the device, e.g., the routing of leads, may be required. Pacing leads can potentially act as antennae for electromagnetic energy impulses. The transfer of electromagnetic energy can lead to myocardial electrical stimulation, tissue destruction at the lead tip–endocardial interface, pain, and damage to the pulse generator circuitry or battery. This may produce adverse effects on sensing, pacing thresholds, and lead impedances and can cause inappropriate pacing acceleration or inhibition and battery depletion. A pacemaker lead is composed of an outer and inner insulation and an outer and inner lead coil. The lead coil is arranged in a configuration to maximize energy-efficient conduction while maintaining flexibility, durability, and minimization of lead diameter. The inner coil is made of filaments wound in a three-dimensional relationship coiled with a certain pitch. This has implications for MRI-related energy conduction based on the resonant frequency of the lead. 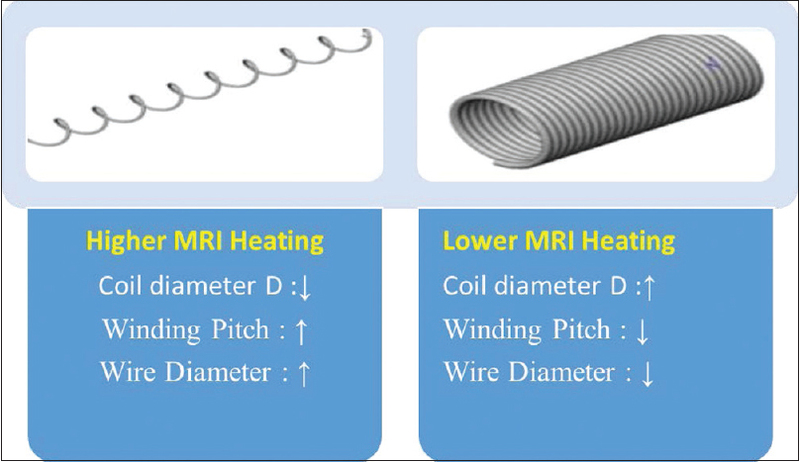 One of lead design changes in an MR-conditional lead is a modification in the pitch of the inner coil. 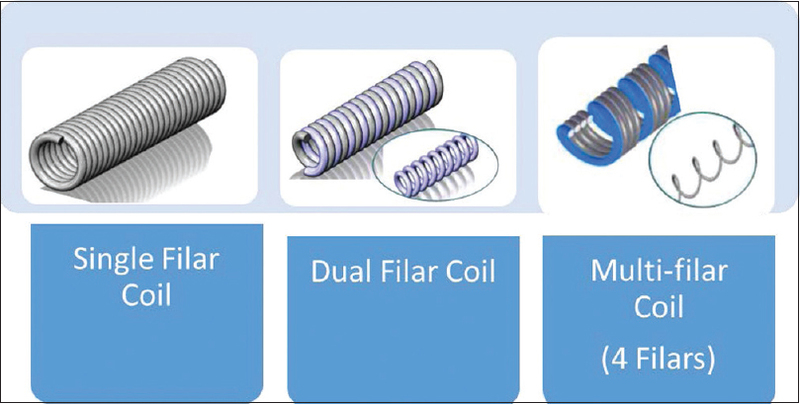 The inner coil was designed with a decreased number of coiled filars, increasing the number of winding turns and therefore increasing the lead inductance. This geometry limits the RFs that can conduct through the lead filaments. The decrease in the number of filars required an increase in the filar diameter to increase the strength of the lead [Figure 6] and [Figure 7]. 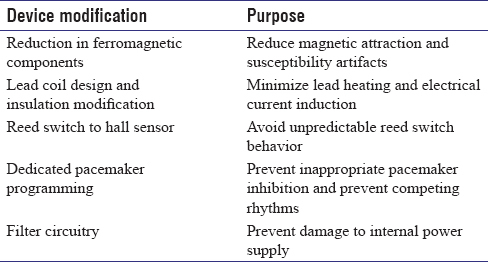 Other challenge in the development of device leads includes the elimination of their movement, heating, and current induction in MR environment. Some movement is possible in leads that have been in place even for more than several weeks to months. Modification of the materials within the leads could reduce the risk of heating and current induction. The modifications include replacement of stainless steel components with copper or nickel alloys in the inner coil or lead shaft and the use of platinum/iridium electrodes at the lead tip. MR-conditional leads have also been modified to conform to the geometry of the inner coil to reduce the transfer of energy which in turn reduces lead-tip heating. MR-conditional devices are now smaller with less ferromagnetic material with consequently improved protection against electromagnetic interference. These changes improved their resilience to artifact and heating induced by MR scanning. These conditioned cardiac implantable electronic device (CIED) systems could undergo MR scanning at 1.5 T without additional risk. The device components have been redesigned to minimize the energy induced and discharged. This has been possible by changes including reduction of the ferromagnetic content of the pulse generator and enhanced protection of the circuitry and internal power supply. The use of a Hall effect sensor in lieu of a reed switch has been introduced that reduces the risk of the device reverting to a “magnet mode” when exposed in an MR imager, which sometimes can lead to asynchronous pacing in pacemakers. The Hall effect sensor's predictable behavior is not influenced by the static magnetic field of the MR environment. Inappropriate sensing and triggering of ICD therapy (shock or rapid pacing and antitachycardia pacing). Complications associated with the failure of device to return to preoperative setting. The presence of abandoned pacing or ICD leads, capped or uncapped, or lead remnants after a partially successful device extraction is considered to be absolute contraindications for MR scanning. Abandoned leads are associated with an increased risk of heating and myocardial damage. Metallic remnants of leads can heat, dislodge, or embolize. In rare circumstances when MR scanning is absolutely required, extraction of abandoned leads might be considered, but this can be associated with a 1%–2% chance of a life-threatening complication. Because of these risks, it is unusual to perform device extraction for patients with leads in situ for many years to allow them to undergo MR scanning. The first MR-conditional pacemaker system was introduced in Europe by BIOTRONIK in 2010 (Berlin, Germany), closely followed by Health Canada and then with the US FDA approval in January 2011 for Medtronic's MR-conditional pacemaker (Minneapolis, MN). Since then, almost all manufacturers have MR conditional devices that can be used for full body scan at upto 3 Tesla. The potentially harmful effects have mainly been identified in older pacemaker and lead technology. During the last decade, a number of small studies have asserted that MRI scans (at 0.5 T and 1.5 T) can be safely performed in patients with implanted pacemakers in carefully selected clinical circumstances when appropriate strategies are used. Roguin et al. reported that following a specific safety protocol, pacemakers manufactured after 2000 can safely go into MRI. These devices are now smaller, with less magnetic material and improved electromagnetic interference protection. Moreover, the absence of clinically relevant cumulative changes in pacing capture threshold, lead impedance, or battery voltage has been shown by Nazarian  in permanent pacemaker patients who underwent two or more MRI examinations. Nazarian  followed 438 patients with implanted cardiac devices (54% with pacemakers and 46% with defibrillators) who had 555 MRI scans. After MRI, the observed changes in the electrical parameters did not require device revision or reprogramming. The researchers concluded that with a protocol based on device selection, programming, and careful patient monitoring, MRI can be performed safely in many patients who have an implanted device. Finally, in a very recent paper, a German group showed that even cardiac MRI may be performed safely when limiting SAR, appropriately monitoring patients, and device reprogramming after MRI, if necessary. Cardiac MRI delivered good image quality and diagnostic value in patients with right-sided devices. Hence, the authors conclude that cardiac MRI in patients with right-sided devices may therefore be performed with an acceptable risk/benefit ratio, whereas the risk/benefit ratio is rather unfavorable in patients with left-sided devices. This finding may simply be due to MRI artifact caused by left-sided devices. It is interesting that the Heart Rhythm Society has not yet published any guideline document regarding MRI compatible devices. Clearly, electrophysiology (EP) physicians are those who implant and follow devices, while radiologists are those who scan the patients. The American college of radiology (ACR) and the Radiological Society of North America warn that medical devices may malfunction or cause problems during an MRI examination. Scanning a patient with MRI-conditional device requires some basic precautions that include effective communication and close collaboration between cardiologists and radiologists. The service burden of scanning device patients raises several logistic problems and requires flexibility and close cooperation between those involved (patient, MRI availability, EP physician, EP nurse, EP trainee, radiologist, radiology trainee, MRI technician, and device representative). All experts in the field agree that competent supervision by an EP physician and team is required before, during, and after MRI to monitor and reprogram the device and to manage any complication [Table 5] and [Table 6]. Anticipating that an MRI examination takes approximately 45 min, plus the time required for device testing before and after MRI, we can expect 90 min per MRI. Scanning an average of 50 device patients per year, it is possible to see how much this service might impact the workload of all the personnel involved. Nevertheless, such costly support is mandatory as scanning device patients may also have serious medicolegal implications. Time-dependent billing code for supervision and management by EP team is not available. Every imaging facility must have a protocol for MR scanning of patients with CIEDs, developed through a collaborative effort of MR and EP/device specialists. Ideally, it should consist of an onsite CIED clinic to interrogate and program the CIED systems. In some cases, it might be possible for radiology suite to establish close collaboration with an offsite CIED clinic where patients are assessed before and after MR. However, on the day of MR scan, a member of the CIED team (technician, nurse, or physician) should be readily accessible for device troubleshooting or reprogramming, if required. Yet, it might not be possible for a member from the CIED clinic to be physically present in the MR suite during the entirety of the scan because of logistic reasons. However, as MR-conditional CIED technology evolves and experiences with MR scanning accrues, the need for onsite CIED support might diminish over time. The way by which the CIED team provides onsite support for patients who undergo MR scanning should be based on a mutual and collaborative agreement between the CIED clinic and the MR Radiology Department. It should be tailored according to the practice standards and resources of the institution. Some might require that a CIED team member be present during the entire MR scan, and others might require that the CIED team provide the same-day assessment before and after MR scanning. The specific personnel requirement will be left to the discretion of the institution. Finally, a cardiologist with expertise in CIED management should be readily available for consultation before, during, and after MR scanning. This physician does not need to be physically present but should be easily accessible to provide advice, if required. The imaging facility should develop a standardized protocol to triage CIED patients for MR scanning. Alert physicians (MR radiologist and CIED cardiologist) of potential CIED malfunction before, during, and after MR scanning. The facility should also have the capability to monitor the patient's vital status during MR scanning. All of the following modalities should be available: (1) pulse oximetry, (2) electrocardiographic monitoring, and (3) capability for verbal communication between the MR scan operator and patient. The facility should also have emergency resuscitation equipment available including, at minimum, an external defibrillator and ready access to an onsite emergency resuscitation cart and team. Most manufacturers have programmable device modification which has to be switched on before MRI, and the device is reverted back to preprogram status post-MRI. This programming has to be done by EP physician/nurse, and postprocedure, all lead parameters and therapy parameters have to be rechecked and reprogrammed as per need of patient. To date, there are no formalized recommendations with regard to the optimal method to monitor the vital status of CIED patients undergoing MR scanning. Currently, three modes of monitoring are often used: electrocardiographic monitoring, (2) pulse oximetry, and (3) intermittent verbal communication. Monitoring of the CIED patient during MR scanning might be performed by a number of qualified individuals including MR technologist, MR nurse, MR radiologist, cardiologist with expertise in CIED management, or CIED clinic nurse. Three important factors determine the personnel composition required for monitoring of a given CIED patient during MR scanning: (1) the patient's medical status, (2) the functional status of CIED, and (3) experience of the team members. A patient with an MR-conditional ICD that is functioning normally who has had recent therapies (pacing or shocks) for ventricular arrhythmias. Patient clearly informed that the device is MRI conditional and not safe. The major legal issue concerns the possible liability of the EP physician, and the institution if a patient, who received a conventional device, needs an MRI. It is difficult for the physician to justify the implantation of a conventional system if an MRI-compatible system is available. Finally, potential damage to patients caused by not performing an MRI scan, which is certainly debatable, often in the context of a lack of data, with regard to type of illness, availability of other diagnostic techniques, need to guide therapy, etc., has to be considered. MRI in CIED patients is no more considered an absolute contraindication to imaging. 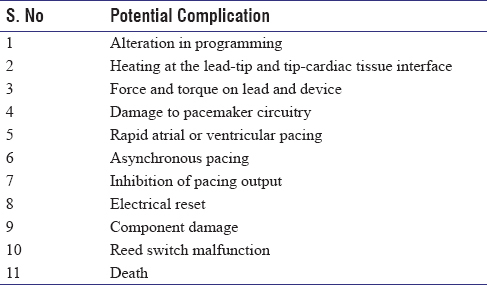 Potentially deleterious effects have been identified, including inhibition of pacing, asynchronous/high-rate pacing, lead-tip heating, loss of capture, and alteration of programming with potential damage to pacemaker circuitry. The patient is subjected to an intense magnetic field, which could impose mechanical forces on ferromagnetic components or inhibit stimulation and cause unpredictable magnetic sensor activation or reversion to an asynchronous program. The reed switches contained in the most current pacemakers are susceptible to the intense magnetic fields generated during MRI. In addition, patients are exposed to a magnetic gradient and RF voltage that could cause a dangerous arrhythmia due to high voltage through the body of the lead, pacemaker reprogramming or power-on reset, and RF interactions with the device such as over- and under-sensing. In addition, a current flow through the lead could result in overheating and thermal damage of cardiac tissue in the area adjacent to the lead electrodes. In fact, a temperature increase at the lead-tip in vitro may result in loss of pacing capture or myocardial perforation. 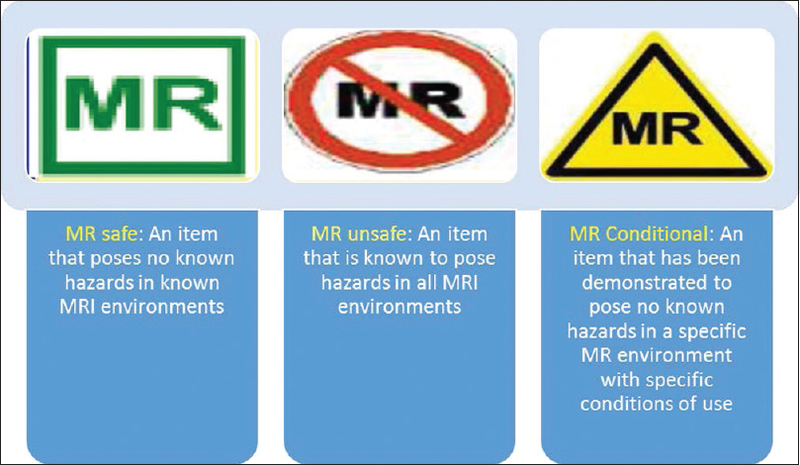 No CIED system is “MR safe,” but selected CIED systems are “MR conditional.” At least four following conditions have to be met with for a relatively safe MRI, namely (a) device hardware has been modified such that MR influence is negligible, (b) conditions to do MRI safely are met with including preprocedure assessment and programming of device to MRI mode, (c) post-MRI, the device should be programmed back to normal therapy, and (d) MRI suite is conditioned to provide appropriate resuscitative therapy in event of complications. Patients may undergo MR scanning without additional known risks as long as manufacturer-specified scanning parameters are followed. It is important to note that the recommended scanning parameters vary among CIED manufacturers. This means that the MR scanning protocol will vary in accordance with the patient's CIED system. As such, clear communication between the CIED cardiologist and the MRI specialist must be established to ensure that these standards are conformed to. For example, some CIED systems permit full-body scanning and others specify an exclusion zone, which prohibits imaging in the thoracic region. In general, all CIED manufacturers recommend maximization of the distance between CIED and scanner, if possible. Most manufacturers also recommend a maximum static magnetic field strength of 1.5 T, with a maximum SAR value of 2 W/kg for each sequence and a maximum gradient slew rate of 200 T/m/s. Most studies that evaluated the safety of MR scanning in patients with MR-conditional CIED systems have been conducted with 1.5 T scanners. There are some data on the safety of MR scanning for MR-conditional CIEDs at 3.0 T. In addition, the long-term (e.g., >5 years) product performance of conditional leads and pulse generators is unknown. Greenspon AJ, Patel JD, Lau E, Ochoa JA, Frisch DR, Ho RT, et al. 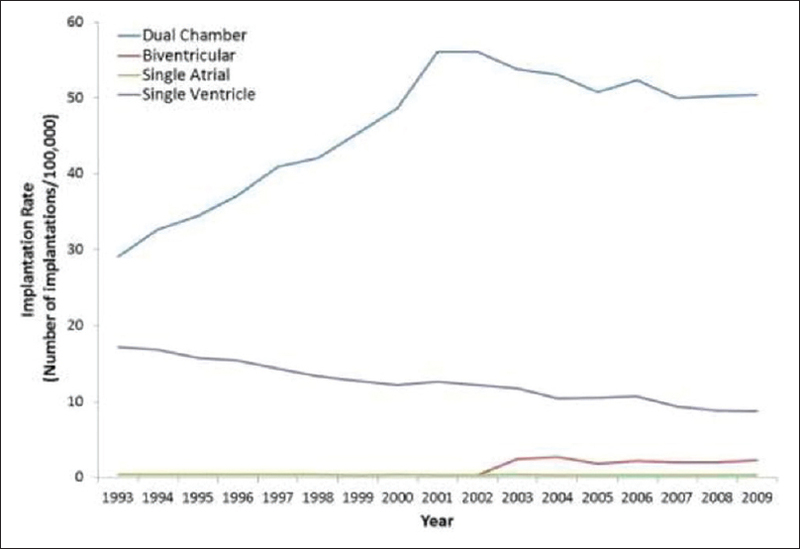 Trends in permanent pacemaker implantation in the United States from 1993 to 2009: Increasing complexity of patients and procedures. J Am Coll Cardiol 2012;60:1540-5. Levine GN, Gomes AS, Arai AE, Bluemke DA, Flamm SD, Kanal E, et al. Safety of magnetic resonance imaging in patients with cardiovascular devices: An American Heart Association Scientific Statement from the Committee on Diagnostic and Interventional Cardiac Catheterization, Council on Clinical Cardiology, and the Council on Cardiovascular Radiology and Intervention: Endorsed by the American College of Cardiology Foundation, the North American Society for Cardiac Imaging, and the Society for Cardiovascular Magnetic Resonance. Circulation 2007;116:2878-91. Kalin R, Stanton MS. Current clinical issues for MRI scanning of pacemaker and defibrillator patients. Pacing Clin Electrophysiol 2005;28:326-8. Harteveld AA, Denswil NP, Siero JC, Zwanenburg JJ, Vink A, Pouran B, et al. Quantitative intracranial atherosclerotic plaque characterization at 7T MRI: An ex vivo study with histologic validation. AJNR Am J Neuroradiol 2016;37:802-10. Roguin A, Schwitter J, Vahlhaus C, Lombardi M, Brugada J, Vardas P, et al. Magnetic resonance imaging in individuals with cardiovascular implantable electronic devices. Europace 2008;10:336-46. Sakakibara Y, Mitsui T. Concerns about sources of electromagnetic interference in patients with pacemakers. Jpn Heart J 1999;40:737-43. Götte MJ, Rüssel IK, de Roest GJ, Germans T, Veldkamp RF, Knaapen P, et al. Magnetic resonance imaging, pacemakers and implantable cardioverter-defibrillators: Current situation and clinical perspective. Neth Heart J 2010;18:31-7. Pavlicek W, Geisinger M, Castle L, Borkowski GP, Meaney TF, Bream BL, et al. The effects of nuclear magnetic resonance on patients with cardiac pacemakers. Radiology 1983;147:149-53. Luechinger R, Duru F, Scheidegger MB, Boesiger P, Candinas R. Force and torque effects of a 1.5-Tesla MRI scanner on cardiac pacemakers and ICDs. 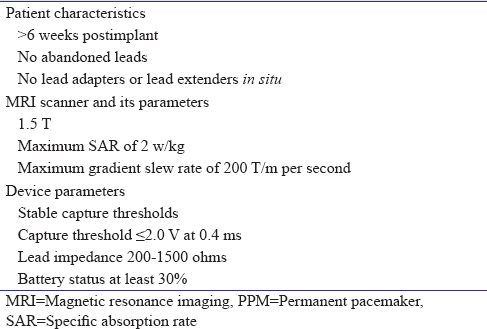 Pacing Clin Electrophysiol 2001;24:199-205. Luechinger R, Zeijlemaker VA, Pedersen EM, Mortensen P, Falk E, Duru F, et al. In vivo heating of pacemaker leads during magnetic resonance imaging. Eur Heart J 2005;26:376-83. Shinbane JS, Colletti PM, Shellock FG. Magnetic resonance imaging in patients with cardiac pacemakers: Era of “MR conditional” designs. J Cardiovasc Magn Reson 2011;13:63. Martin ET, Sandler DA. MRI in patients with cardiac devices. Curr Cardiol Rep 2007;9:63-71. Kanal E, Gimbel JR. MR-conditional pacemakers. AJR Am J Roentgenol 2012;198:W502-3. European Society of Cardiology (ESC), European Heart Rhythm Association (EHRA), Brignole M, Auricchio A, Baron-Esquivias G, Bordachar P, et al. 2013 ESC guidelines on cardiac pacing and cardiac resynchronization therapy: The task force on cardiac pacing and resynchronization therapy of the European Society of Cardiology (ESC). Developed in collaboration with the European Heart Rhythm Association (EHRA). Europace 2013;15:1070-118. Nazarian S, Roguin A, Zviman MM, Lardo AC, Dickfeld TL, Calkins H, et al. Clinical utility and safety of a protocol for noncardiac and cardiac magnetic resonance imaging of patients with permanent pacemakers and implantable-cardioverter defibrillators at 1.5 Tesla. Circulation 2006;114:1277-84. Lowe MD, Plummer CJ, Manisty CH, Linker NJ, British Heart Rhythm Society. Safe use of MRI in people with cardiac implantable electronic devices. Heart 2015;101:1950-3. Forleo GB, Della Rocca DG, Panattoni G, Schirripa V, Sergi D, Magliano G, et al. Clinical and electrical performance of currently available MRI-safe pacing systems. Do all devices perform in the same way? Int J Cardiol 2013;167:2340-1. Roguin A, Zviman MM, Meininger GR, Rodrigues ER, Dickfeld TM, Bluemke DA, et al. 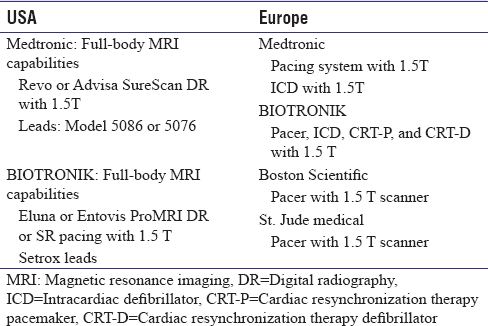 Modern pacemaker and implantable cardioverter/defibrillator systems can be magnetic resonance imaging safe:In vitro and in vivo assessment of safety and function at 1.5 T. Circulation 2004;110:475-82. Nazarian S. Clinical utility and safety of a protocol for noncardiac and cardiac magnetic resonance imaging of patients with permanent pacemakers and implantable-cardioverter defibrillators at 1.5 Tesla. Circulation 2006;114:1277-84. Nazarian S, Halperin HR. How to perform magnetic resonance imaging on patients with implantable cardiac arrhythmia devices. Heart Rhythm 2009;6:138-43. Nakai T, Kurokawa S, Ikeya Y, Iso K, Takahashi K, Sasaki N, et al. MRI mode programming for safe magnetic resonance imaging in patients with a magnetic resonance conditional cardiac device. Int Heart J 2016;57:173-6. Tsai LL, Grant AK, Mortele KJ, Kung JW, Smith MP. A practical guide to MR imaging safety: What radiologists need to know. Radiographics 2015;35:1722-37. Nordbeck P, Bauer WR, Ritter O. Comments on 'safe magnetic resonance image scanning of the pacemaker patient: Current technologies and future directions'. Europace 2012;14:1532.